If you can't already tell, today's post is all about the fringe! I've teamed up with ASOS and a group of blogger friends (The Rachel Ross, Stilettos and Sequins, Visions of Vogue, Upbeat Soles, & Foggy Day Studio) to show you not one, but six different ways to style fringe this season! It's so fun to see how each girl incorporated her own personality into the trend. For my outfit, I chose to style this berry-colored swing dress with fringe sleeves. I was mostly attracted to the loose fit and overall bohemian feel to the dress. The fringe sleeves add another layer of dimension and it's a great outfit choice for all the fun holiday parties that are quickly creeping up on us. For a more structured look I decided to add a belt which really helped draw attention to the fringe details. I can't wait to re-style the dress with a big comfy shearling vest! 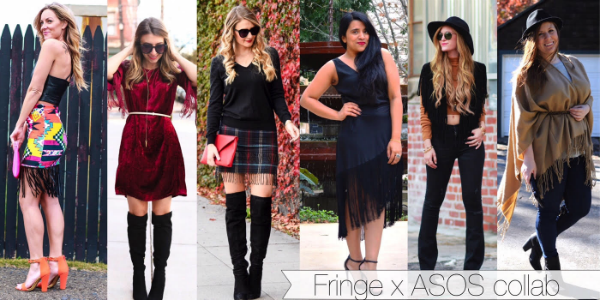 For more fringe inspiration be sure to stop by each one of the girl's blogs below. I promise you won't be disappointed. I can't even begin to pick a favorite because I adore each of their outfit selections. I love this post and your dress is adorable!! !